I’ve said it before and I’ll say it again – Yogyakarta is an impressive treasure trove of food. On my most recent trip to the city, even though it’s perhaps the 6th time I went there, I still discovered new, hidden culinary gems that my taste buds haven’t sampled before. So I decided to compile these new culinary findings into a sequel to a previous post on Yogyakarta’s food: Where to Eat in Yogyakarta. As usual, here’s a bit of a warning: this post will leave you craving for food – especially if read in the middle of the night! Located on the famous Wijilan Street otherwise known as “Gudeg Street”, Gudeg Bu Lies is one of the most notoriously popular ones down the street to the point that domestic tourists flock the two dining areas it has during peak season. At first, I thought the hype was overrated since – well – us Indonesians love to hype up a lot of things, really. But then I gave their food a try and discovered that they definitely earned their popularity. I got the Gudeg Krecek Komplit (IDR40.000) which includes chicken, egg, tofu, and krecek or spicy stewed beef skin and let me just say that although the portion does not look too filling, it made me extremely full! I loved how the seasoning of the chicken, egg, and tofu was not too sweet like most gudeg eateries do it and the krecek was at the right level of spicy – not to the point of burning your mouth, but also not at the point of having no heat at all. The chicken was also super tender and it was super easy to tear it apart with spoon and fork. Gudeg Bu Lies is also home to one of the best sounding street musicians I’ve heard in Yogyakarta. They were a duo of guitar and bass and my gosh, they sung in beautiful harmonies with a strong bass voice driving the songs. It was pretty awesome listening to them perform. 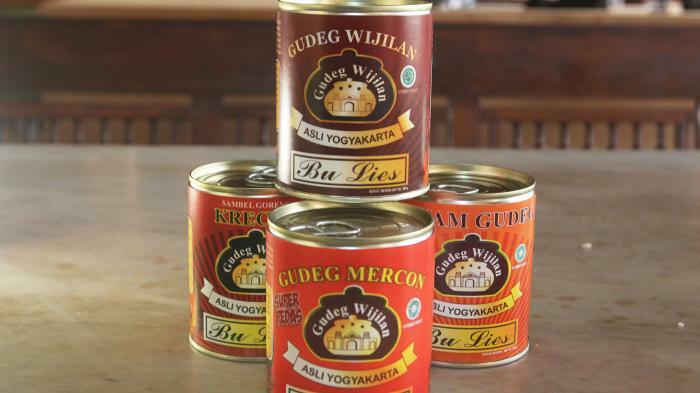 Also, it turns out that they also sold their gudeg in a can! I didn’t get to buy one since I just noticed the canned gudeg while getting out of the parking lot, but I’m definitely interested to give it a try because it’s freakin’ canned gudeg – one of the food I never thought I’d see being canned! I wouldn’t have known about this little stall if it weren’t for my amazing guide, Mr. Didik. Heck, when I posted this on my Instagram story, the Location services couldn’t even determine where I was since it’s so off the beaten path. This is his favorite noodle stall and since Bakmi Jawa or Javanese noodles is my all-time favorite dish from the city, he decided to share this gem with me. And oh my gosh, I can see why he would love the noodles here. I got Bakmi Jawa Joss’ Bakmi Godhok with iced tea (only IDR15.000!) and what came out was rice noodles with salted egg, tomatoes, cabbages, and ground chicken served with a thin soup. What I noticed first was the soup which was super duper thin in consistency compared to the usual thick broth that Bakmi Godhok usually has. Surprisingly, the different texture of the broth (or should I say soup?) was what made the dish really special because its warmth and texture made it taste like comfort food, as if it’s your mother’s noodle soup for you when you’re sick. There wasn’t a lot of flavors within the dish itself except hints of savory tastes and a bit of sourness from the tomatoes so you might want to add a bit more soy sauce to it or if you’re into spicy flavors, ask the guy at the stall for cut up chili. Bakmi Jawa Joss itself is a very interesting place with very interesting patrons. Since the location of the stall is near a massage parlor run by blind people, most of the patrons are blind and are led to the stall by the waitress or even the stall owner/chef himself. What I love about them is that they would even lead the blind to other stalls nearby if they want to eat at a different place. That kindness is something I admire and something you should definitely see for yourself as well. I stumbled upon this place for the first time during my first visit to Yogyakarta four years ago and had been wanting to come back ever since – except that time, I didn’t document a lot of my trip and so I didn’t know where Lombok Ijo Mbah Wiji was located or even its exact name! When my guide, Mr. Didik pulled up across the street from the place and told us we were having lunch there, a sense of familiarity struck me and when I saw the rice field next to it – which used to be a lot larger, but with the same yellow house next to it, I nearly cried because I finally found it again. Lombok Ijo Mbah Wiji is still the same blue little shack it was in 2013 and still has the bamboo platform covering a quarter of its space for cross-legged dining as it did four years ago. However, a banner on the wall said that they were moving soon to a restaurant space 500 meters down the road since apparently, a lot of public figures have dined at the place and it became too small for large crowds that visited it after its rising popularity. I had its Sego Lombok Ijo (only IDR7.000!) which was what I had the last time I was here and it tasted the same as it did back then! The dish itself consists of three components: red rice, sauteed papaya blossoms, and lombok ijo or green chili soup with tempeh and long beans in it. The lombok ijo was still tasty – its coconut milk broth rich in flavor while the tempeh tender. Be careful when you have a spoonful of it though, especially since the long beans and the chili look way too similar. The sauteed papaya blossoms was also fantastic. Unlike most papaya blossom dishes, it didn’t carry a bitter taste with it. Apparently, this was due to the fact that they cooked it with clay dirt! Yes, it turned out that clay helps take away the bitterness of papaya blossoms. This is definitely a super awesome local dish to try if you’re vegans in Yogyakarta. However, if you like your meat, you can add empal or sweet fried beef to the dish for IDR12.000 – which I absolutely recommend for any meat lover since the ones they make here are thick and juicy. I discovered this local favorite on a rickshaw ride around Yogyakarta with Mr. Harry van Yogya during which we went to this place for dinner. The place is quite fancy for an angkringan or Yogya street food – a two-story bamboo place in comparison to the usual wagon with a mat laid out in front of a shop. However, the price and the food definitely scream angkringan. This little place serves buffet Indonesian food with all the dishes laid out for diners to pick. You can pick whatever you want and simply pay as much as you take. Out of the many options available, I picked rice with sauteed green beans, squash, chicken satay, and omelette (IDR17.000). It turned out to be one of the most heavenly things I’ve ever had! The vegetable sides were especially brilliant since the spices seeped in well into each component. The green beans were a bit spicy, the squash curry-like in flavor, and the chicken stay had the right balance of sweet and savory. The place was also a very local place for people in Yogyakarta and it was evident that it was one of the favorite spots to hang out. It’s also an awesome place to grab a late-night bite if you’re staying nearby since it opens until 2 AM. These four places are local culinary hidden gems in Yogyakarta I’m extremely excited to share with you since they were pointed out to me by locals of the city as well. However, I really believe that there’s more to Yogyakarta’s culinary scene than these as well and if I return to the city one day, I’m really looking forward to explore more of its local cuisine and find more tucked away treasures like these ones. If you have any recommendations on other places to dine in Yogyakarta, do let me know in the comments and I’ll sample them next time I’m in the city! Ps: a special shoutout to Mr. Didik from Prima Sukses Tour (0812-2750-4999 / primasuksestour@yahoo.com) and Mr. Harry van Yogya (twitter.com/becakcitytour) for introducing me to your favorite places to eat. Contact them if you’re heading to Yogyakarta, folks!